Last week I was lucky enough to have lunch in one of the Mediterranean places in Cary and passed by Grand Asia Market on the way there. Of course I had to make a u-turn and go back. I love ethnic markets especially one such as this, that is truly authentic and carries Thai, Chinese, Korean and a smattering of Indian ingredients. I perused the produce section first and bought Chinese broccoli, bok choy, Chinese spinach and watercress, all wonderful greens that I enjoy sautéed or in salads. Watercress has always been one of my all time favorite green and is not only nutritious and is packed with nutrients especially vitamins K, C and A.
I also enjoy the fish section as there are plenty of live fish to chose from and you can pick a whole fish and have them fillet it for you right there. The benefit of that is freshness but best of all, you take the carcass home and make fish stock. The packaged goods are extensive with sauces, spices, noodles, snacks of every imaginable flavor. A fun store with pretty much everything you might need to cook most Asian meals including a place to get prepared foods in the front if you want a snack or a meal to go. Turns out this is standard for large Asian markets, an all in one trip with food, restaurant and most also have imported beers such as Singha, which is my favorite. I made a point of sourcing a couple other Asian markets as well. My hair dresser clued me in to Li Ming’s Global Mart. This is more than an Asian market as the name says; they carry products from the West Indies, Mexico, all parts of Asia and Indian ingredients. It’s a huge store and has a large seafood, meat and produce section. The produce is sometimes a bit wilted, but if you pick and chose you can find what you are looking for. 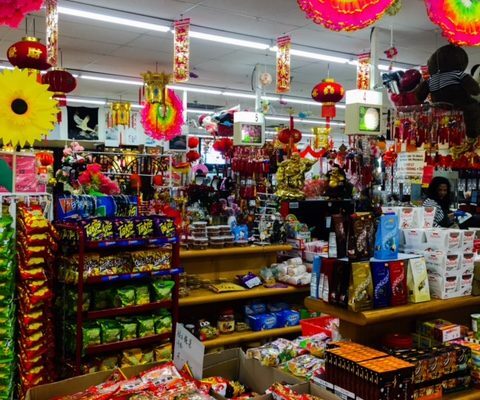 There is Shilla Oriental Market in Durham as well, which is small but carries many of the dried goods you need for a delicious Asian meal with more of a focus on Korean and Japanese items such as Korean chilies and homemade kimchi. 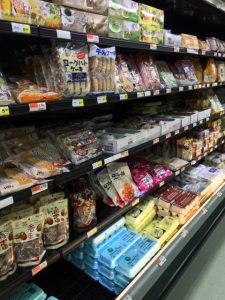 H Mart is the latest addition to Cary and is large, authentic and fun with a wonderful cafe with Korean food such as galbi, bulgogi, and kimchi.